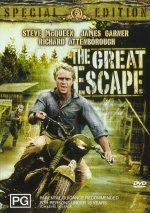 The Great Escape has always been one of my favorite films, but I had no idea how much of it was true till I saw this PBS documentary. Check out the interactive graphic on the left side of this screen for the details. Look, there’s even a fan club. You, like me, are a blog addict. There are worse things to be hooked on. I just saw this movie on sale at the grocery store. I bought it for $9.99.